It was a warm Friday in May, and I left school in a hurry after teaching my last class. I swung through the drive-through of Arby’s, ordering a sandwich as large as my head and then wondering why I’d just ordered a sandwich as large as my head. No time to worry about that! To my great relief, there were no spelling errors, egregious or otherwise. 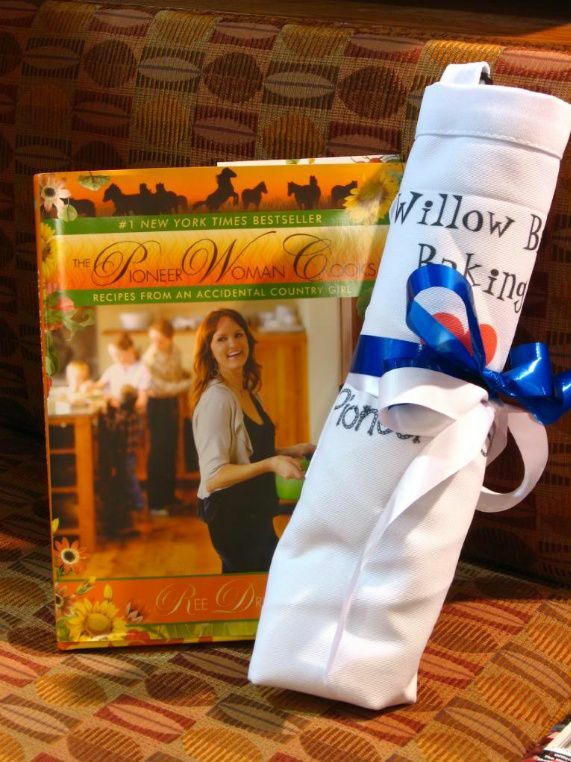 Can you imagine handing an apron to Ree Drummond that said, “WILLOW BIRD BAKING <3 PINEER WOMUN." Actually, now that I think about it, she might've liked that. That’s right, I was on my way to meet P-Dub herself at her Charlotte booksigning. Now, I’m not really fanatic about celebrities. I was in love with Isaac Hanson for about 2 weeks in middle school before realizing he was never even going to know I existed. So I snapped out of it, went about my business, and didn’t bother with this “fan” silliness anymore. 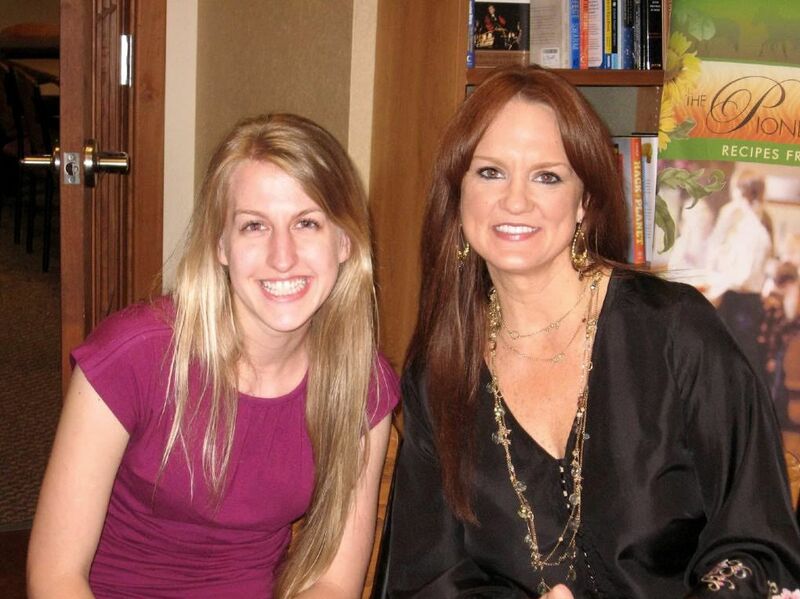 That being said, I love Ree Drummond. She’s warm, hilarious, genuine, and probably more deserving of her fame than any of the Hollywood crowd. And last time I mentioned her in a post, I got hate mail! From real, live, professional trolls! You know someone’s really “made it” when they have their own little official hate squad following mentions of them around the internet. Cool. She was as lovely as I expected when I met her in person, but for me, it was one of those Christmas Story experiences. You know the Christmas Story movie, right? The one with the leg lamp? In the movie, little Ralphie stands in line for hours to meet Santa with one goal echoing incessantly in his brain: to ask for a Red Rider BB Gun. That gun is all he wants, and all he’s been able to think about for weeks. He rehearses his lines to perfection. Finally, he reaches the front of the line and stares up into the face of a jaded department store Santa. It’s time to ask for his dream! He musters the strength to speak and . . . he panics. He chokes. He stares. He asks for a football. Thankfully, I didn’t ask Ree for a football. 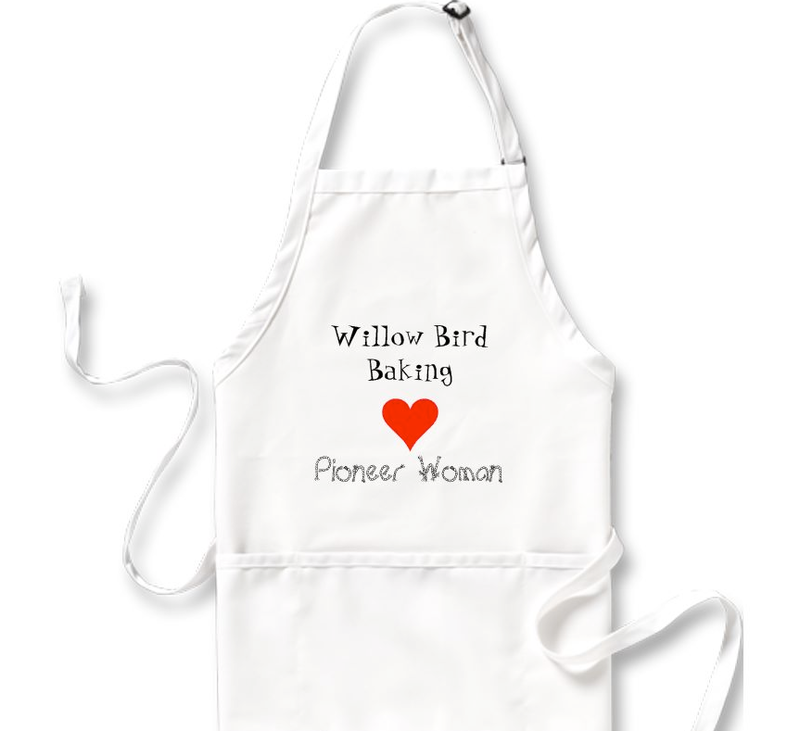 What I did do is shuffle about, hand her the apron shyly, sort of mention Willow Bird Baking, and then give a dazed grin to the camera. Suddenly we were walking out of the building and I thought about turning around to scream, “No! I wanted a Red Rider BB Gun!” Somehow I don’t think that would have helped. Anyway, despite my stagefright, Ree was charming and interested in each and every one of the hundreds of people who came to see her. I hope she’s enjoying her apron, and I dedicate this big ol’ heaping Chocolate Mousse Pie to her. Well, okay, I sort of messed that up too. But not too badly. 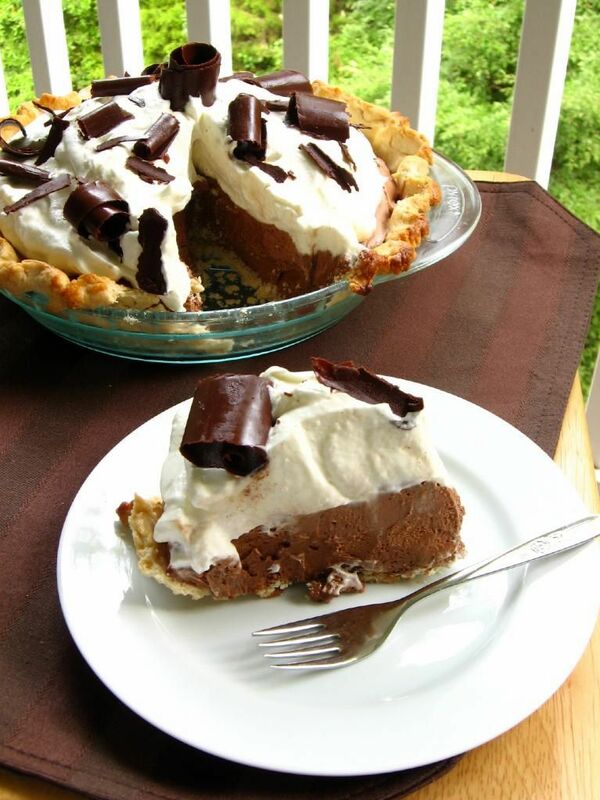 The pie was tasty: a buttery, flaky pie crust embracing a thick mess of pillowy, indulgent chocolate mousse and topped with slightly sweetened, loosely whipped cream and chocolate curls. There aren’t many things that taste better than that crust + chocolate combination, in my opinion. 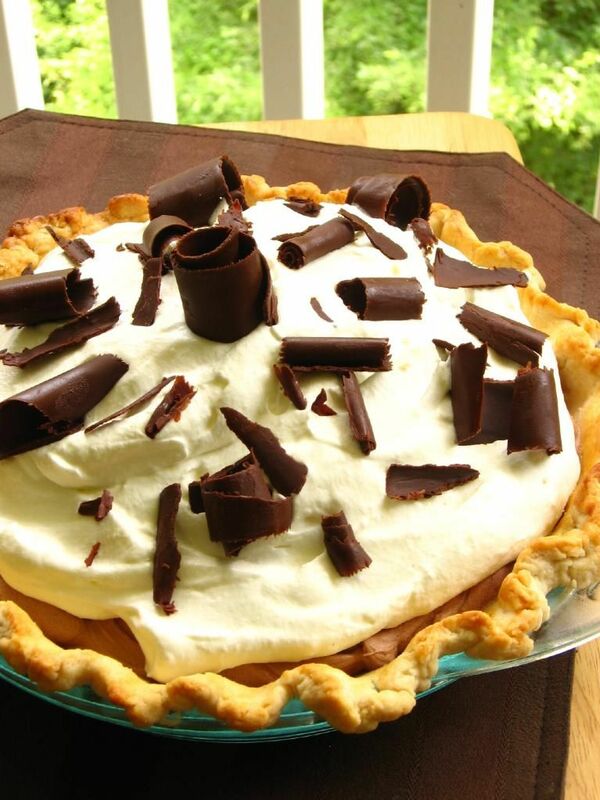 It reminded me of the French Silk pies I used to love at Perkins — anybody out there still have a Perkins in their town? Eat a slice of that French Silk for me, please. But there was an issue; namely, my mousse was grainy. Two or three other commenters on P-Dub’s site had the same problem, but most obtained smooth mousse. I think it comes down to creaming your butter and sugar. Make sure your butter is room temperature, thoroughly softened, and that you cream the sugar in until it’s really dissolved and fluffy. Regardless of the slight sugar crunch, the pie was a rich, luxurious treat. My Sunday school class got ahold of it and left an empty pie plate in its place — and if that’s not a good sign, I don’t know what is! *you can substitute vegetable shortening here if you wish, but I highly recommend the lard! To make the crust, pulse flour and salt together to combine. Add scoops of lard and pulse into the mixture has the texture of coarse sand, about 10 seconds. Add in chunks of butter and pulse until butter pieces are no larger than small peas, about 10 pulses. Add minimum amount of water and pulse on low. If dough remains crumbly and doesn’t come together, add another tablespoon of water. Add as little as is required to enable the dough to be rolled into a ball. Form the dough into a disk, wrap in plastic, and refrigerate for 20-30. Preheat oven to 450 degrees F. Roll disk of dough out to around 2 inches larger than your pie plate and transfer it, situating it in the plate. Fold the excess dough around the edges and crimp, trimming where necessary. Cover the dough with parchment paper and fill with pie weights or dried beans, pressing to the edges. Bake for around 20 minutes. Remove weights and paper, egg wash crust, and bake 5-10 minutes more, until golden brown (you won’t be baking it again, so make sure it has good color — shielding edges with foil if they begin getting too dark). Let crust cool completely. To make the mousse, in a large bowl with an electric mixer beat 1 cup (2 sticks) of butter (I used unsalted and added a dash of salt) and 1 ½ cups of white sugar until fluffy (about 2 to 4 minutes). NOTE: make sure butter is very soft and at room temperature, and beat until sugar is entirely dissolved, or the chocolate mousse will be grainy. When melted chocolate is cooled, drizzle it over the butter/sugar mixture. Add 1 teaspoon of vanilla extract. Beat the mixture thoroughly until combined (on a Kitchen Aid mixer, you will be using the whisk attachment). To make whipped cream, soften gelatin on 3 tablespoons cold water for about 2 minutes. Add 1 tablespoon hot water and stir to dissolve gelatin. Let cool while you mix other ingredients in a bowl to soft peaks. Add gelatin mixture to whipped cream and fold in gently. Pile whipped cream onto top of pie and refrigerate. Garnish with chocolate curls if desired. I think it’s so great that you got to meet someone who inspires you! (And that apron is adorable! 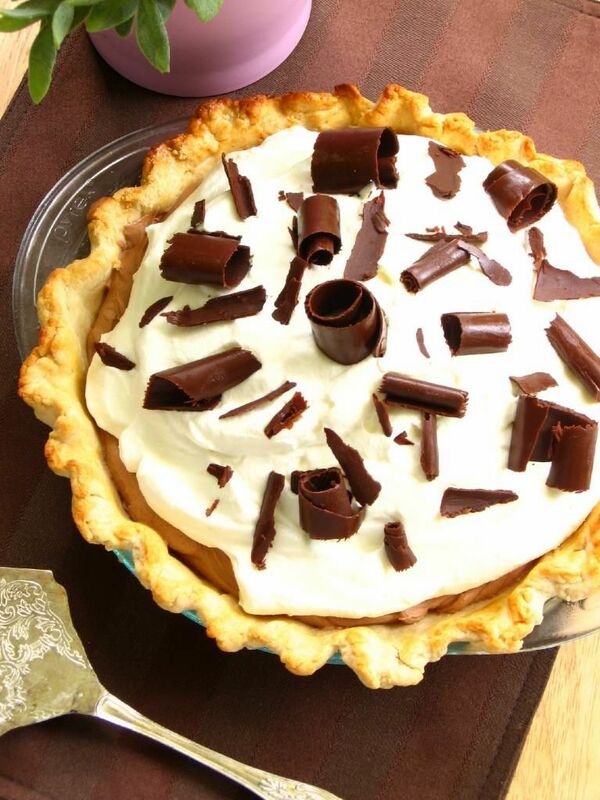 )This pie looks fabulous, and I’d eat it graininess and all! I actually really think I would like that crust… it looks soft. Thanks Megan! The crust is very soft and tender. Mmm love it. I know what you mean about meeting P-Dub being better than meeting a celebrity. Between her and Deb of Smitten Kitchen…I don’t know who would have me shrieking in a super high pitched girl voice more quickly. 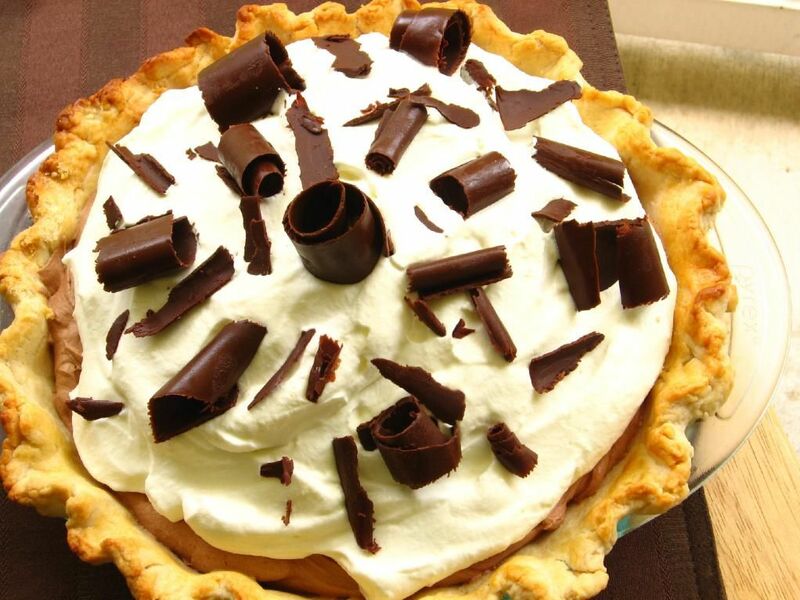 The chocolate mousse pie is an excellent tribute. I’m literally drooling over it! How sweet of you to print and take an apron to the book signing. I want to be your best friend. The pie looks fabulous. 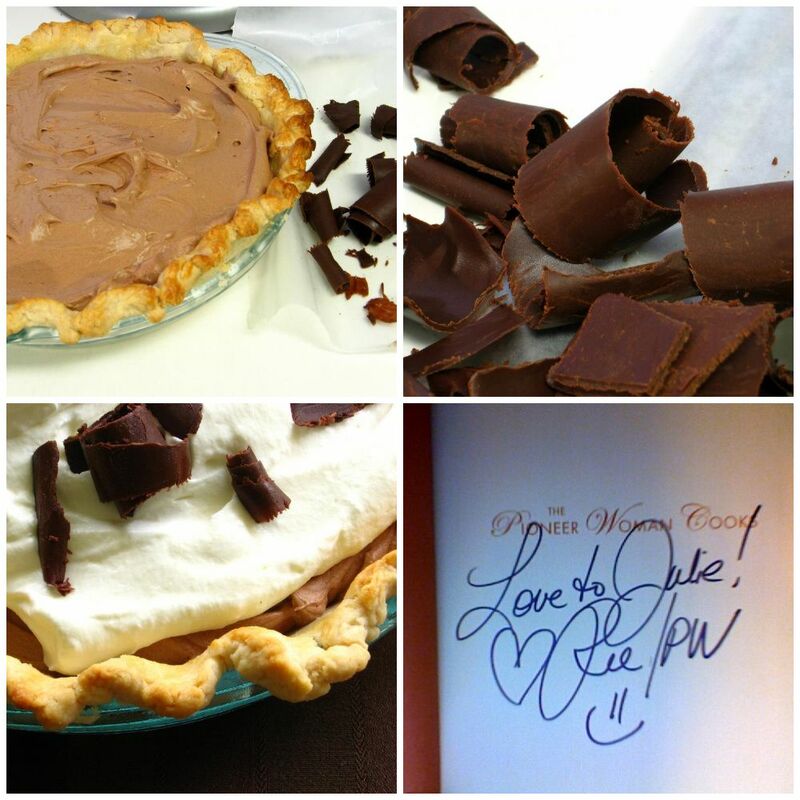 I see a chocolate curl with my name on it…preferably accompanied by a piece of pie too 🙂 This looks delicious Julie. 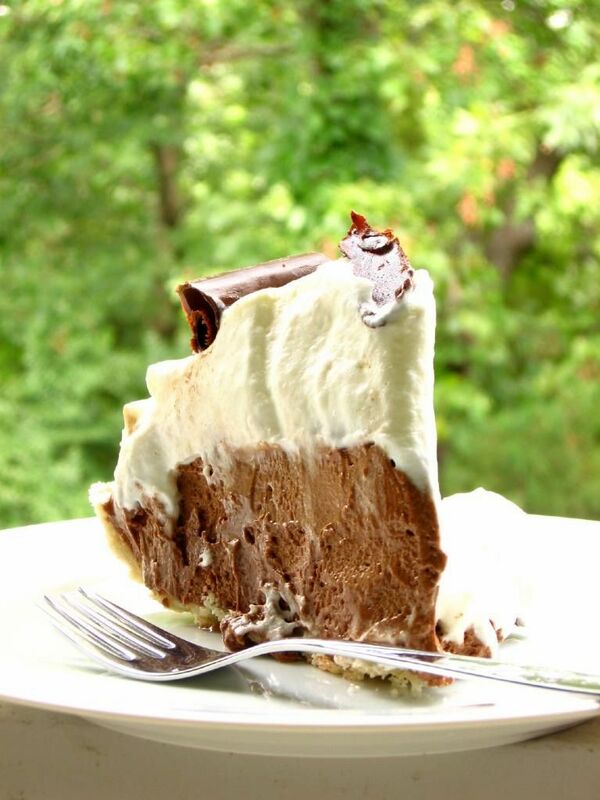 That pie looks like the best chocolate cream (mousse) pie EVER! Love your generous chocolate curls, especially that one in the middle! I bet Ree loved the apron! The pie looks so lovely and i can feel its melting texture. THose chocolate curls are so tempting.. Great collection of recipes u have here…. I adore this story of you meeting PW – I wish every day that I too will be able to meet her in person some day! I also really like the apron you had made for her! Where did you have it made? 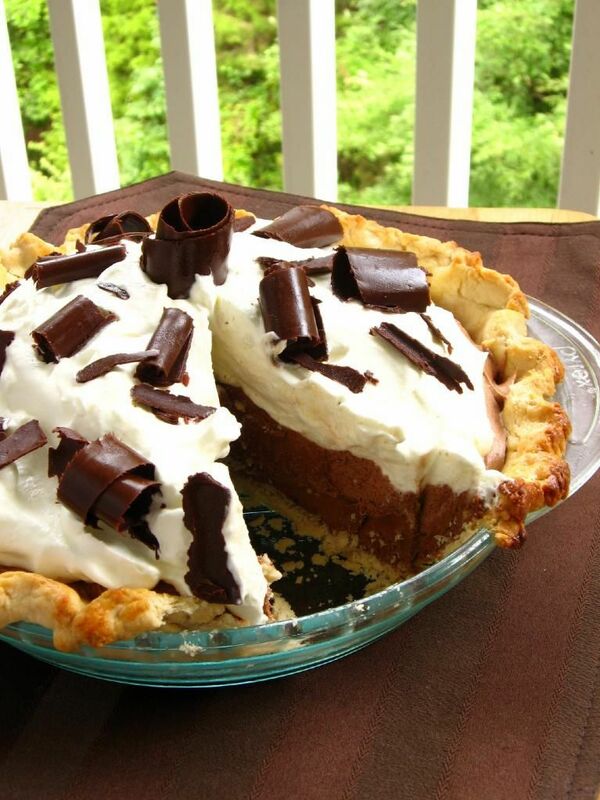 And the pie….oh my! I want it now!!!! I am in my 15th week of pregnancy and all I want is a good chocolate baked item….this is a perfect solution for me. Thanks for sharing! Thanks, Avril 🙂 I had the apron made at Zazzle.com — it came out really nice! I so wanted to go see her when she came! Unfortunately my parents were in town so I couldn’t sneak away. You are awesome to give that apron though, I love it! Your pie doesn’t look half bad either. I mean really, you can’t go wrong with chocolate, no matter what the consistency is. Oh, and you totally brought back the high school memories with your mention of Perkins. Thats so awesome you got to meet her in person! Okay…I am a wee bit jealous right now! 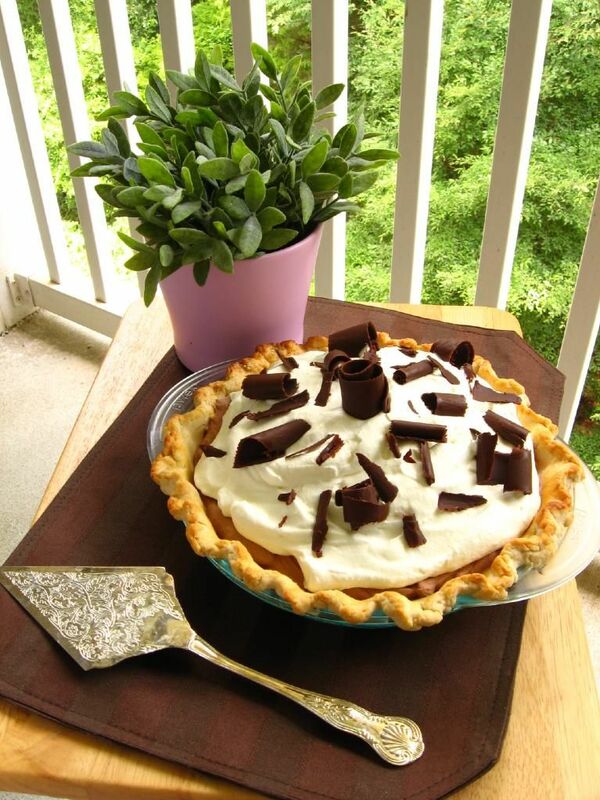 Your pie looks amazing…is it time for dessert yet? I think it’s time!! 😉 Thanks! Woah that whipped cream is insane!!! How can anyone talk bad about Ree?!?!? I’m totally in love with her and would be her groupie (Grateful Dead style) if she ever left the ranch!!! Man this pie looks great though. The Hubble has been asking for a pie like this for a while now. Thanks for posting it! Thanks, Maranda! Mike’s a chocoholic, so I’m glad I saved him a piece of this. What a funny story, I would totally be like that but blushing on top. I love these types of pies they just don’t really make stuff like that in Australia, I might have to start a one woman quest to change that. I went to go see her as well, but I didn’t make it through the line. It was getting so late and I was starting to fall asleep. So glad you got to meet her. I made this pie, but the mocha version she made. It tasted heavenly, but it was runny. My mom later informed me that while you whip these silk pies it needs to stay cold. I guess AZ is just too hot in the summer. Oh well, good excuse to try again. Your’s looks AMAZING! Oh no, pie melt!! I do think that’s a great excuse to try again. 🙂 And mocha sounds amazing! I really can say nothing but: YUM. You are too darn lucky to have met her, Julie!It’s one of my dreams as I adore her so much! She is a superwoman! She was hilarious and sweet, just as you’d imagine! 🙂 Maybe she’ll be out your way soon! I was gobsmacked when I got hate email / nastygrams after casually mentioning that I read Ree’s Black Heels to Tractor Wheels book and found it sweet on my journal. Then I googled it up and haters of PW have their own rancorous movement. How very odd. So much negativity. And for what? Sheesh. Some people need to get a life. I made the pie, after seeing on the PW cooks site last year. It turned out grainy (but delicious) for me, too. Next time I’ll nuke the butter for 5 seconds or so to allow it to fully cream with the sugar. Aww, I am so glad to hear that, Erinn!! Thank you for your kind words! Hope you love every single thing you try. Make sure to tell me what you think and let me know if you ever have questions!! We still have Perkins, but no longer a Bishops Buffet (regional chain) with there Chocolate ambrosia. This looks a fair bit like that. 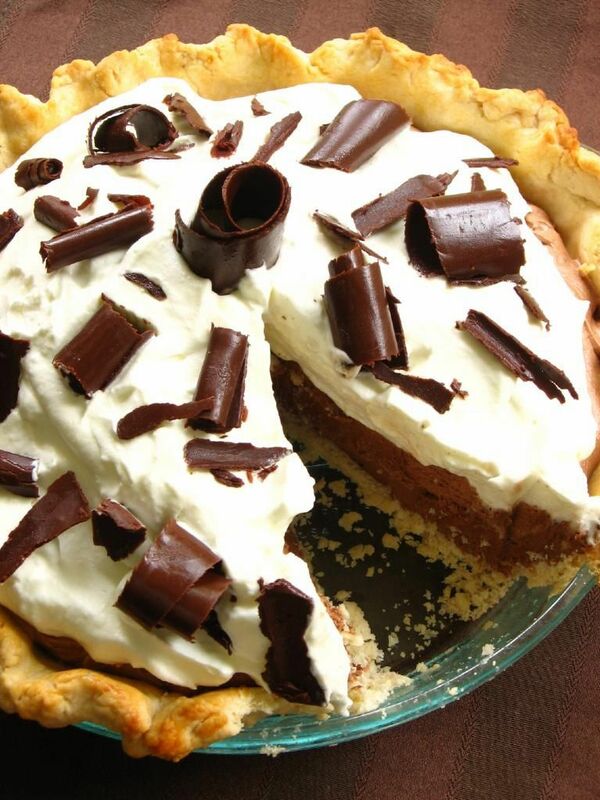 This recipe looks to be close to the original Bishops Buffet Chocolate Ambrosia “Curly Pie”. Unlike others found online, the original certainly did not use instant pudding mix topped with Cool Whip.